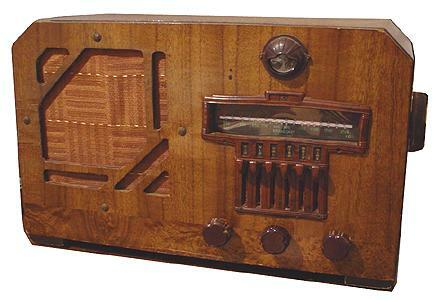 "Photo finish" cabinets were not solely a Philco thing because a few other companies used the same finishing technique on their radios. The cabinet of this Airline has a nice photo finish that was in excellent shape. I purchased the Airline at a VRPS auction as a little kit project because it initially appeared to be missing many exterior parts, including the knobs, dial escutcheon, pushbuttons, tubes, and more other miscellaneous parts. Fortunately, I had the chance to inspect the Airline before the auction and noticed that everything for the radio was all included. All the parts and tubes were kept in a bag and stuffed inside the radio. The downside with the radio was its badly warped and unreadable dial. A reproduction was made on the computer and printed out on paper and sandwiched between two pieces of transparencies. The power transformer in this radio had obviously been replaced perhaps because the original one died at some point. Nevertheless, the radio worked well after a few capacitors were replaced. The reproduction dial I created for the 62-361 is below.